I'd to admit that I'm not the biggest fan of cheesecake, but I do eat them once in a while, and that's why I took such a long time to make one. The last cheesecake I did was the Mahattan cheesecake, and they lasted like forever in my fridge. 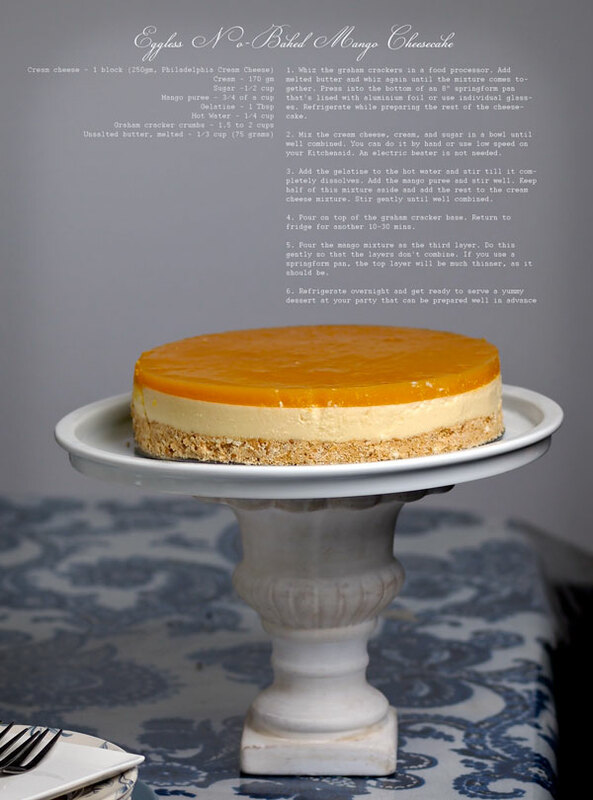 I browsed Foodgawker and stumbled on this pretty mango cheesecake in a cup by Edible Garden. The recipe is based on hers, but I made 'zebra patterns' on the middle part. Okay, barely a zebra pattern. I made one big 8' cheesecake with a nice thought of distributing some to my neighbors. Everything was smooth until I sliced the cake. The crust. It crumbled :( Cit. The thought of passing this 5/10 rated cheesecake to my neighbors has to hold. You see, sigh.. I wanted to make a thick base, so I added more Marie biscuits. And of course I added more melted butter. Apparently the butter is not enough...hmmm I always had no luck with the base part. Sobs. It was either too hard or too crumbly. I never got it right... Yet. 1. Whiz the graham crackers in a food processor. Add melted butter and whiz again until the mixture comes together. Press into the bottom of an 8" springform pan that's lined with aluminium foil or use individual glasses. 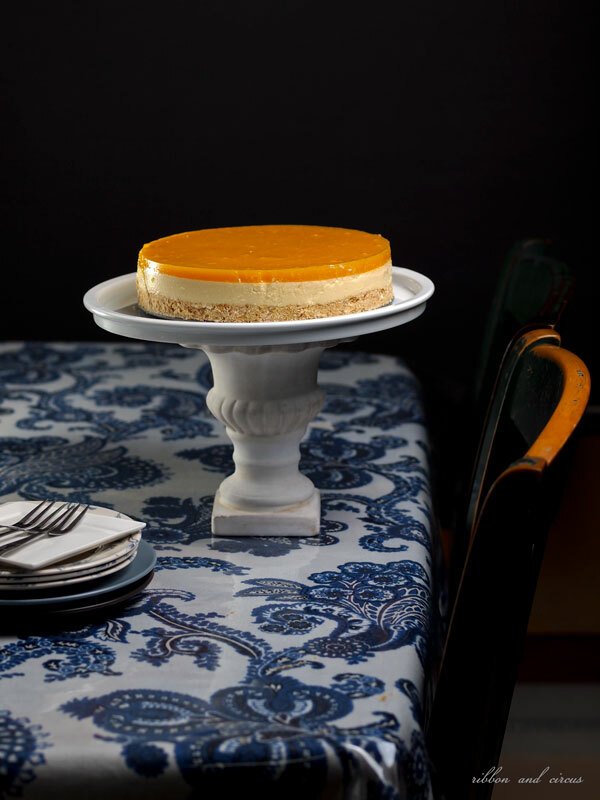 Refrigerate while preparing the rest of the cheesecake. 2. Mix the cream cheese, cream, and sugar in a bowl until well combined. You can do it by hand or use low speed on your Kitchenaid. An electric beater is not needed. 3. Add the gelatine to the hot water and stir till it completely dissolves. Add the mango puree and stir well. Keep half of this mixture aside and add the rest to the cream cheese mixture. Stir gently until well combined. 5. 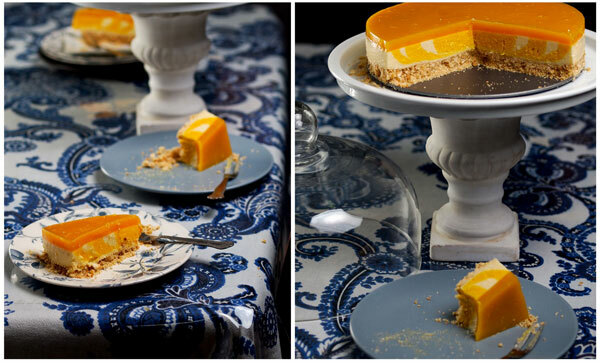 Pour the mango mixture as the third layer. Do this gently so that the layers don't combine. If you use a springform pan, the top layer will be much thinner, as it should be. 6. Refrigerate overnight and get ready to serve a yummy dessert at your party that can be prepared well in advance! It is a beautiful cheesecake! TQ for sharing this recipe. I love it to max! Wow - this looks great. I'll have to try it out!